Formerly the KV Jazz & Blues Festival, KV Music Fest is here with an all-new format that is sure to make this year the best one yet! 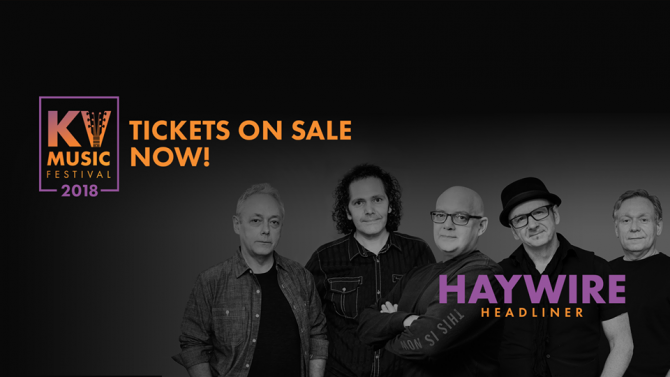 With headliner multi-award winning Canadian rock band, Haywire headlining the main stage with up and coming bands Suit N Ties, Midnight Casuals and Halifax Pier opening you won’t want to miss this night of fun. As always there will be free shows throughout the community and an all-new ticketed event for YouTube sensation and marketing icon, Dave Carroll. Don’t wait, the party to end the summer will be one you won’t want to miss. Eddie Chase and Graffiti Four are a 50’s and 60’s Band playing solid golden graffiti from some of Rock N Roll greats. Partyline has been entertaining audiences from 2 to 102 for the past three decades. Bandmates and friends, Emery, Geoff, and George will have you clapping and toe tapping down memory lane with classic songs from the 50’s through to today. returned in 2016 for a successful first full tour of 12 dates. The summer of 2017 saw him return to play a demanding schedule of 19 live dates. Such has been the success of the tours that Ethan returned briefly in January 2018 to play several sell-out headline shows and April 2018 sees him guest at a major gig at Harbour Station Arena, Saint John. Another tour of The Maritimes is planned for summer 2018. Multiple CCMA & JUNO Award nominee Chris Cummings has been a successful singer and songwriter since 1994. With more than 2 decades in the business, he continues to prove his talent for pushing the boundaries of country music while managing to stay true to his roots. Dave Carroll is an award-winning singer-songwriter and longtime member of the band Sons of Maxwell. However, he is likely best known for his troubles with a broken guitar while traveling with United Airlines. Dave used his ability as a master storyteller on social media to share his issue with the world. The resulting YouTube music video called “United Breaks Guitars” became an instant viral hit, the #1 music video in the world and, today, over 150 million people have been introduced to his story. 100% of ticket sales will go to the St. Josephs Hospital Foundation to support the purchase of a 3-D mammography machine. The KV Music Fest will feature Canadian Rock icon, Haywire as well as up and coming bands Suit N Ties, Midnight Casuals and Halifax Pier. This is a ticketed event and must be 19 years of age to attend.